I had just come in from a morning's kayak and was loading the kayak onto the car to go home. It was a beautiful morning but I had not been able to get close to any shorebirds for good photos. 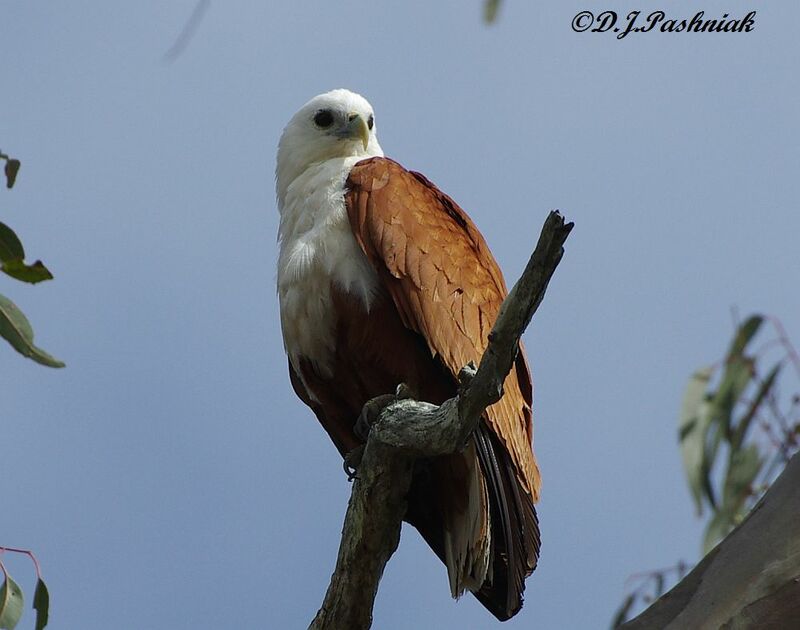 I glanced up into the very tall gum tree that stands beside the car parking area when I saw this Brahminy Kite (Milvus indus) sitting up in the tallest part of the tree and quietly watching me. A photo opportunity like this gave my rather dull morning a perfect finish. 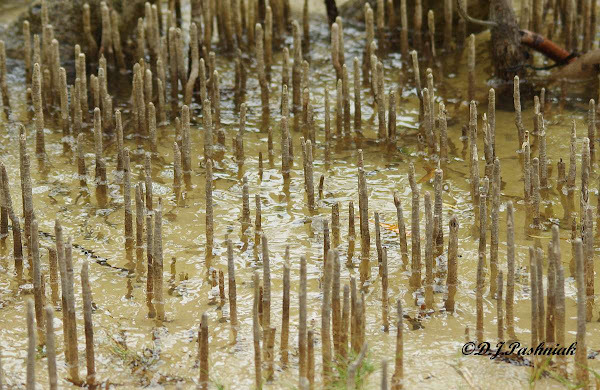 This post is for NatureFootstep Waters. This is the northern end of Lake Somerset which is one of the water storage dams for Brisbane. The dam is currently at 98% capacity. 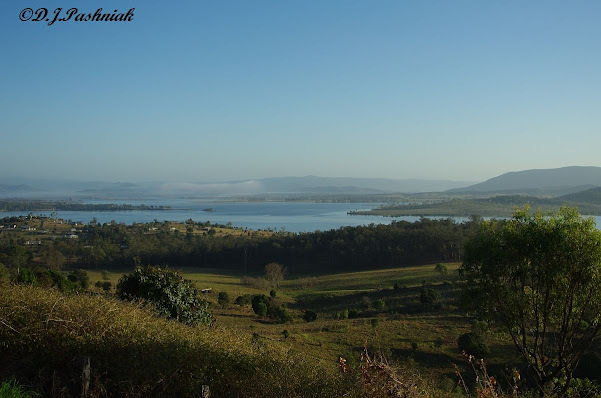 It was very early in the morning when I drove past there the other day and fog was still hanging over some of the hills. 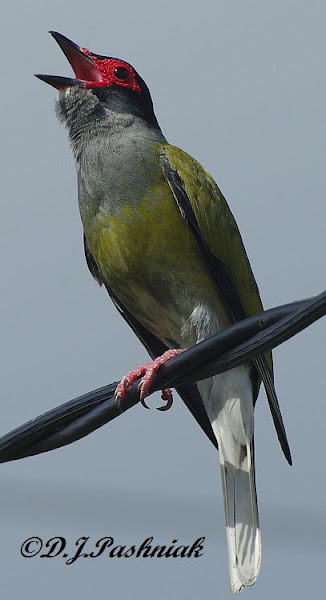 I often hear Figbirds (Sphecotheres viridis) sitting high in the trees. However, that's not much good for a clear photo so when this one sat on the electricity wire the other day I walked quietly around the house to take some photos. The bird was so intent on singing that it took little notice of me and I was able to get a series of clear photos. This is a male bird - the female has a grey/brown color around the eye and is streaked down the front. I often hear Red-winged Parrots (Aprosmictus erythropterus) flying over my place but they seldom come down into any of the trees. The other day I heard one - then saw it fly down into a Grevillea bush. This particular Grevillea bush had almost finished flowering and had set seed. The Red-winged Parrots are seed eaters and these seeds must have been just right to their taste! I went closer as carefully as I could and there were two of them in the bushes. I stayed down there for nearly an hour trying for photos where the birds were not half hidden among the branches. Finally one of the birds hopped down onto the fence - unfortunately in the shade and with a background of my neighbor's shade house. It looked at me as carefully as I was looking at it. 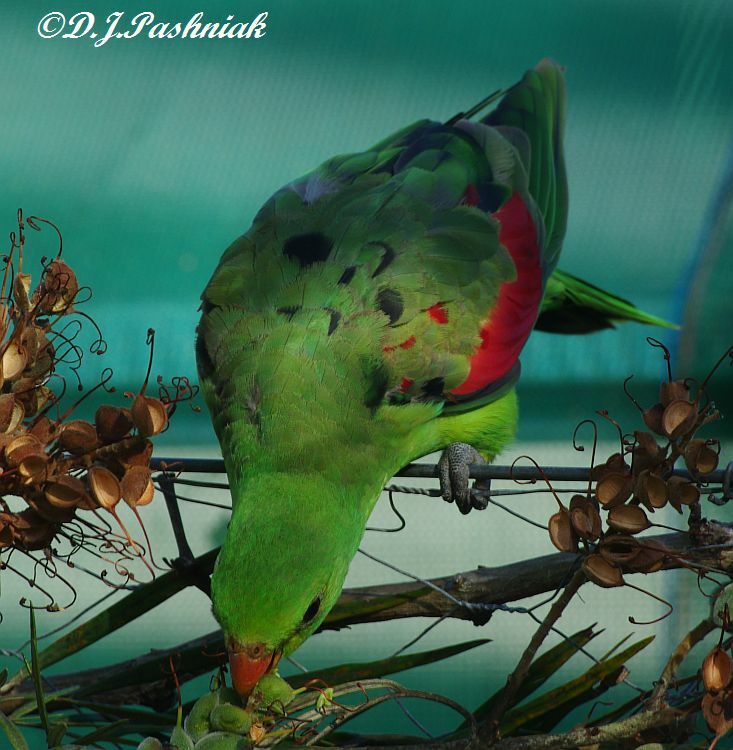 It sat and ate seeds and used its left foot to do this - in typical parrot fashion! Finally it reached down towards some seed pods lower down and I could get a good look at the feathers on its back. 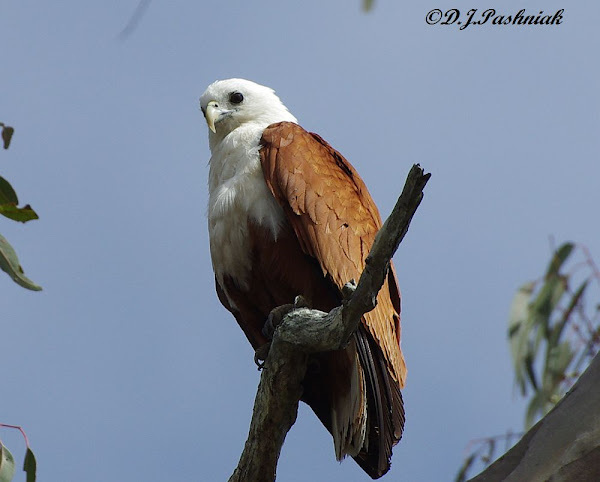 The color was rather splotchy - only just beginning to get the dark color of the mature male. 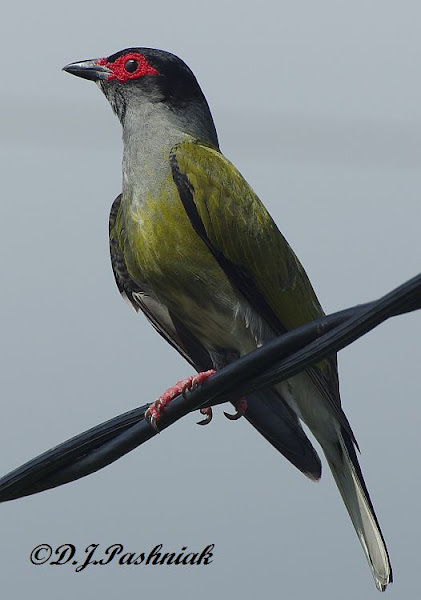 Then the second bird hopped down to the same place and this one had the typical color of a mature male. 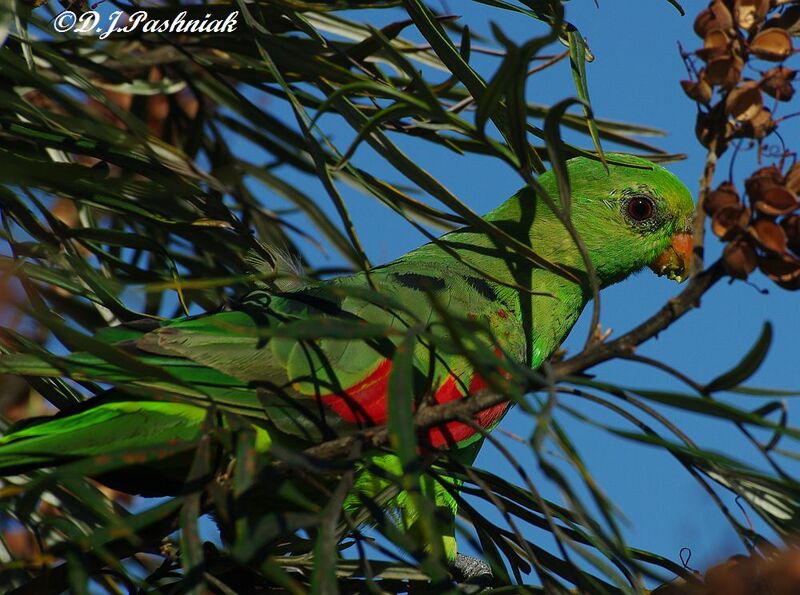 I kept waiting and taking photos and finally it hopped up higher into the bush and into the sunshine. There were some branches and leaves in front of it but the sunshine really showed off the colors beautifully. I still didn't get the "perfect" photo - one without anything in front of the bird and in full sunshine! - but it was worth waiting for what I did get! 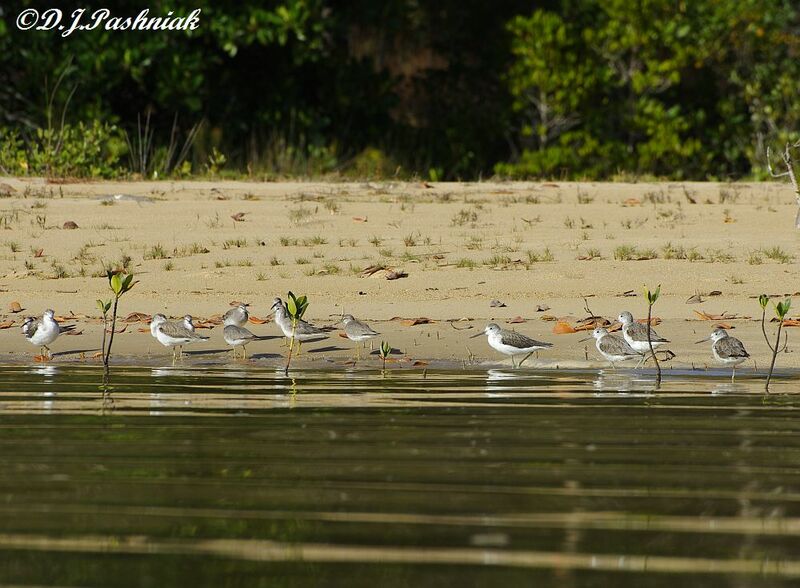 I was kayaking the other day when I saw some Common Greenshanks on a sandbank. I let the wind and tide drift me in toward them and was able to get some good close photos. However, the really interesting photos showed the feathers on the backs of the birds' heads. They made a definite line down the middle of the back of the head. 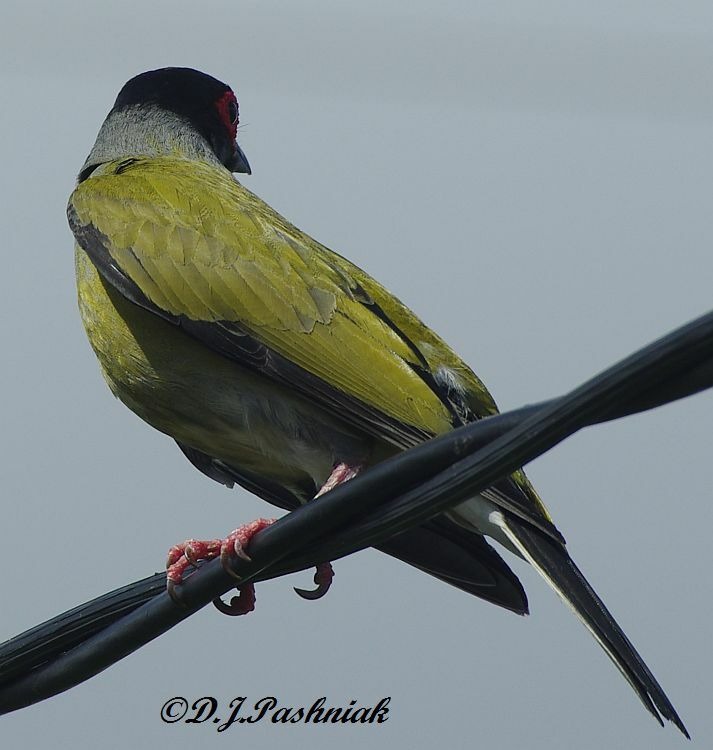 It reminded me of that hair style from years ago where both sides were brushed back and towards the back of the head! This post is for Scenic Sunday. 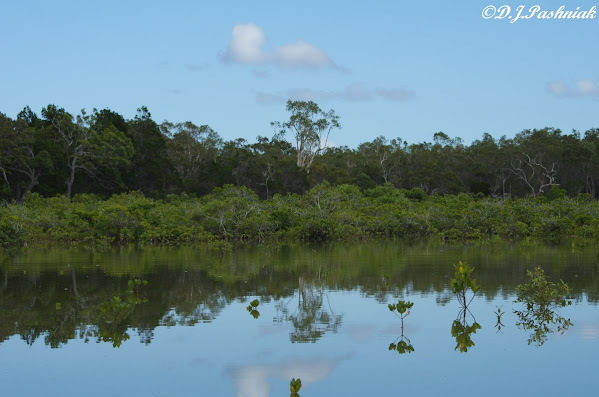 Carlo Creek is only 3 Kms from Rainbow Beach, but where Rainbow Beach overlooks the ocean Carlo Creek is on the Sandy Strait - the waterway which comes inland behind Fraser Island and south to Cooloola Cove. There is a marina at Carlo Creek and a boat launch for private boats. 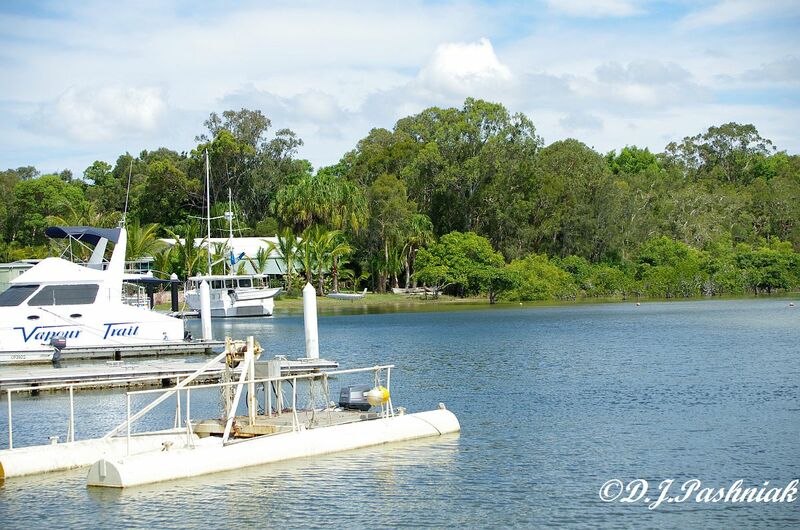 This is also the place where off-shore fishing charter boats leave for their trip up the Strait and out the channel between Inskip Point and Fraser island. It is also a very convenient place for the start of kayaking trips to several of the shorebird roosting sites. Over the last few weeks we have seen Black-winged Stilts (Himantopus himantopus) in several places around the bay where we have never seen them before. This last week I saw four at the Crab Creek roosting site, roosting with other shorebirds. 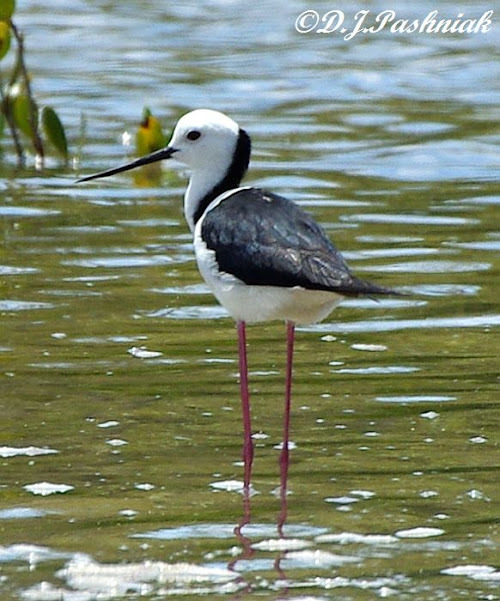 Black-winged Stilts live in Australia all year and are only nomadic to different wetlands within the country. They have a most distinctive call which sounds rather like a very small puppy yipping. 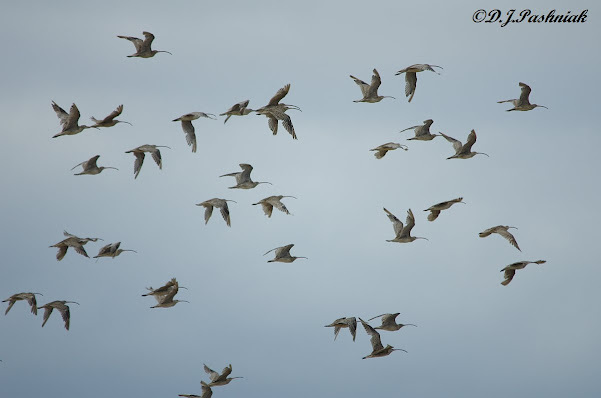 When I first saw the birds at Crab Creek they were roosting with a large flock of Bar-tailed Godwits. 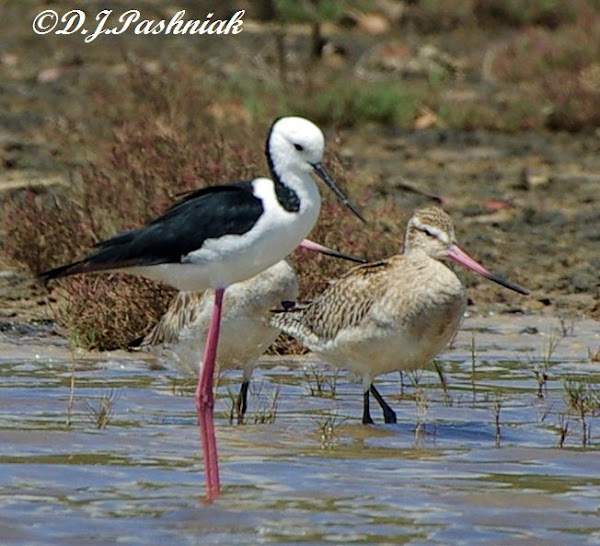 I had never seen them standing beside Godwits before and their very long legs almost made the Godwits look short and dumpy! When they flew off their long legs trailed behind them. They then settled down in shallow water and I was able to get good views of them by themselves. Over the last few weeks I have had several comments and questions about kayaking with a camera so I thought I would explain what I use and how I use it. I have a sit-on-top kayak made by Viking. 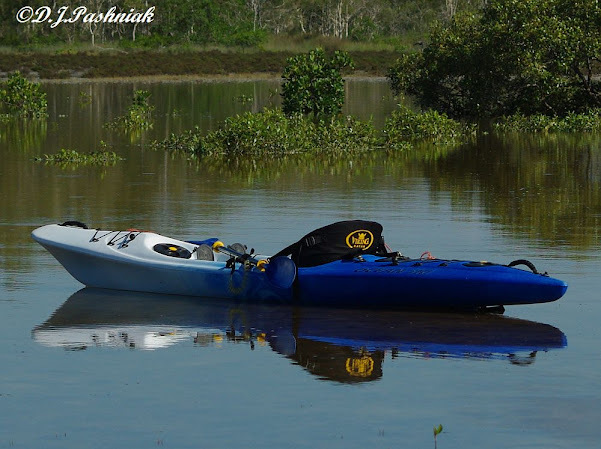 Kayaks such as this are more closely related to wave skis than to the traditional kayak. I wanted something that was very easy to slide on and off - especially if I turned it over when I was out by myself on the bay. I had a shorter and wider model when I first started kayaking around here but - after a white-water kayak, with my son, down one of the rivers in the Olympic National Park in Washington State I wanted something a bit faster and more manoeuvrable! The flat waters of the bay were pretty tame after the white water of the river! Viking kayaks have a seat moulded into the hull of the kayak but I also have a stiffened fabric seat which attaches to the kayak and gives a better back rest. I carry my camera in a Pelican case which are advertised as unbreakable, waterproof, and dustproof. These cases are totally sealed and on the few occasions mine has dropped off the kayak it has floated perfectly! I have it attached to the kayak with rope and also under some stretchy fastening behind me. When I get to where I want to take photos I can loosen the case from behind me and open it on my lap and take the camera out. Of course I only do this when the water is nice and still! 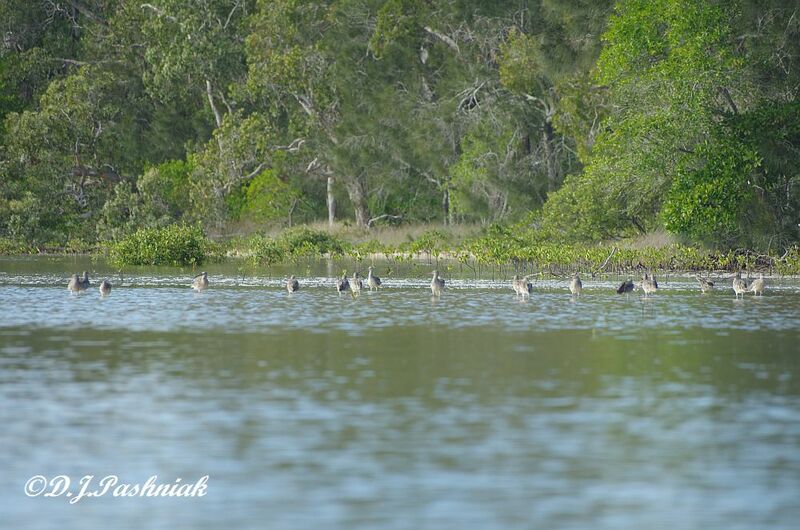 Birds will let you get much closer on the kayak than when you are walking on shore. I get into position some way from the birds and let the tide and wind push me in closer. Waving a paddle around is guaranteed to make any bird take off. 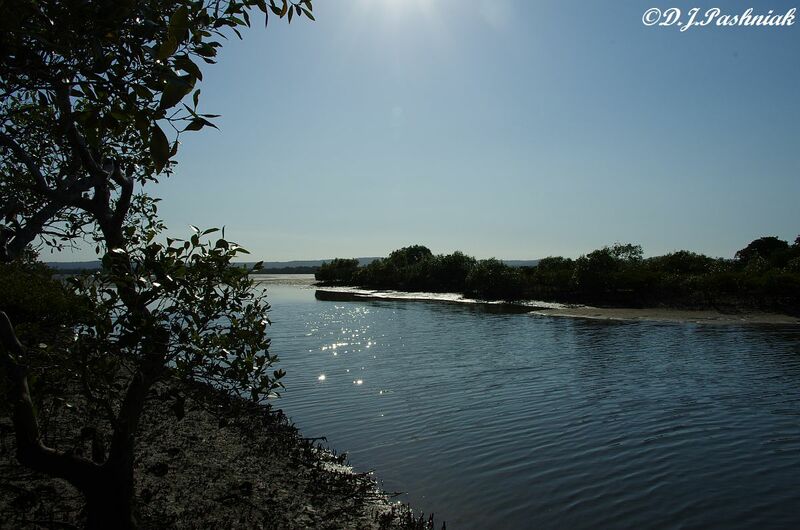 I know I have done a good job when I take my photos and then slowly push my way out again levering the paddle against the sand under the water - all without disturbing the birds! When I kayaked around to the Airport Roost the other day most of the larger shorebirds had just flown off . They looked as if they were going in the direction of the Mullens Roost. 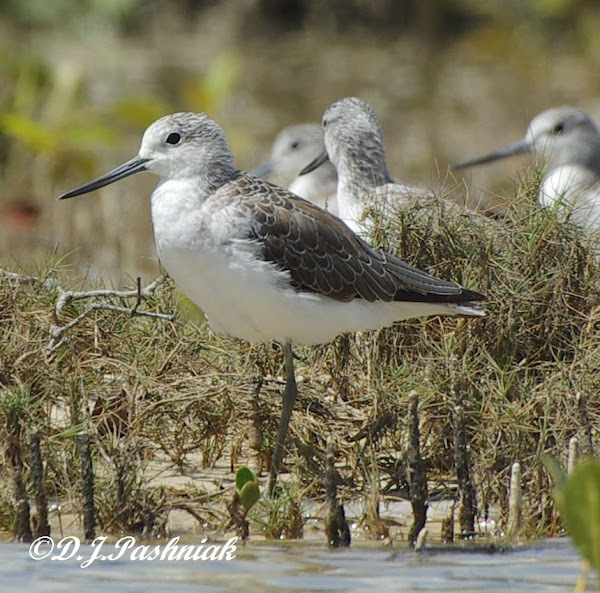 The smaller and medium sized shorebirds were strung out along the strip of sand. These were mainly Grey-tailed Tattlers, Terek Sandpipers and Greenshanks. 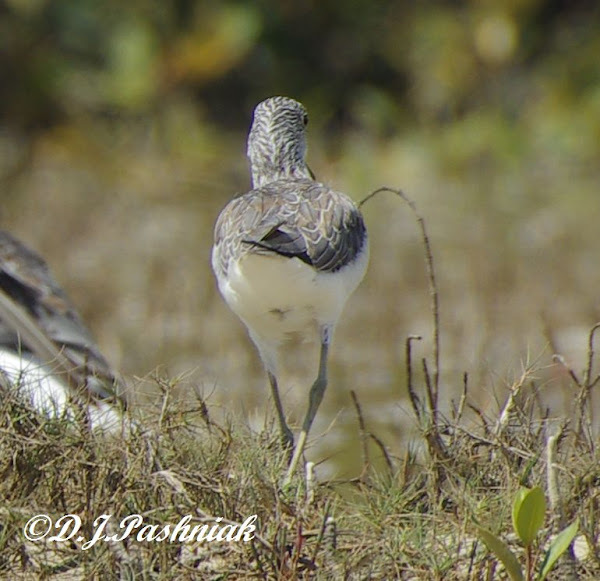 Tattlers and Greenshanks standing next to each other made an interesting size comparison. Tattlers looked very much smaller. There were also a few Pacific Golden Plovers. At the far end of the strip of sandy beach there is a ridge of sand that runs out into deeper water. 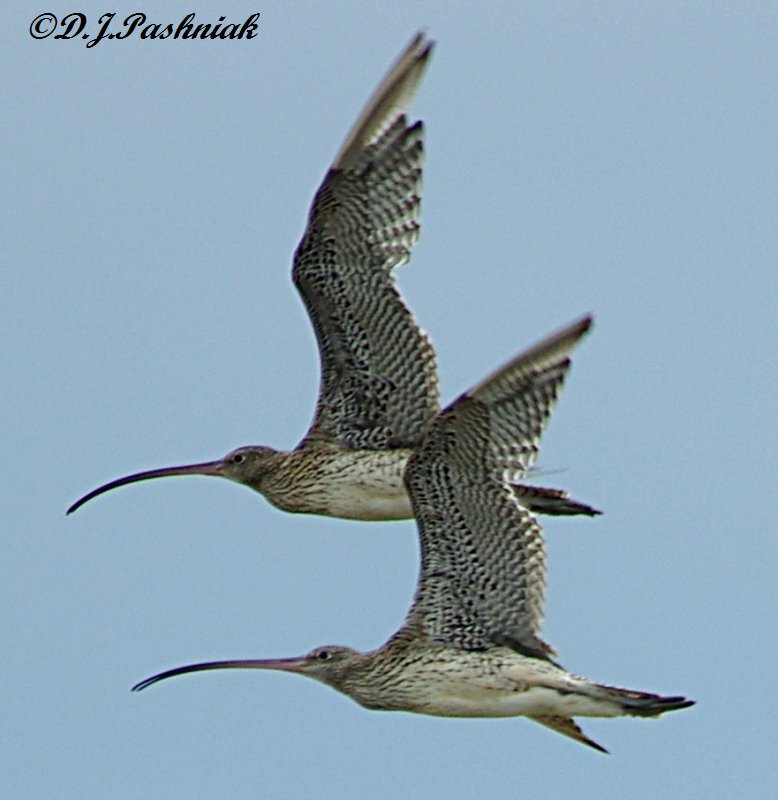 Often Eastern Curlews stand there out in the water. 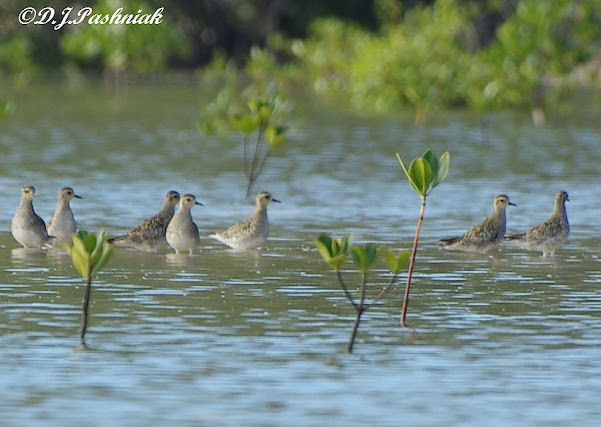 It was surprising to also see some more Pacific Golden Plovers in the same area as most of the time I see them in areas of saltmarsh. This is the same place I posted photos of last week but this time it was a high tide. 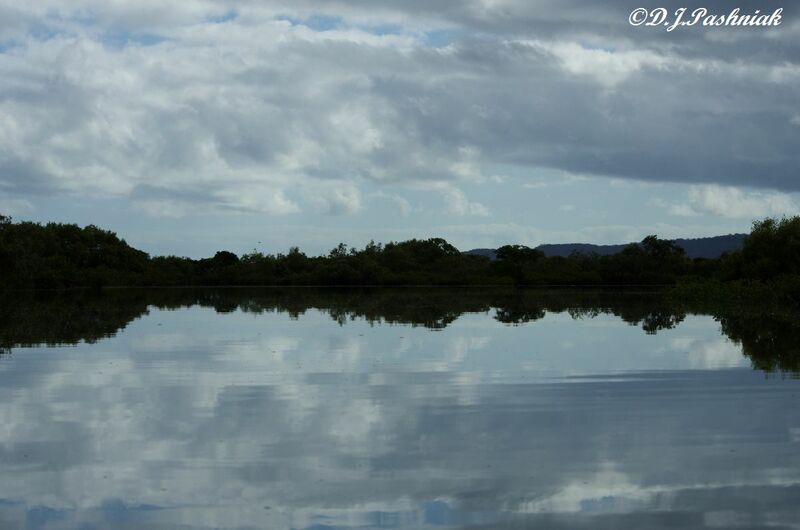 There was no wind and the reflections were beautiful. 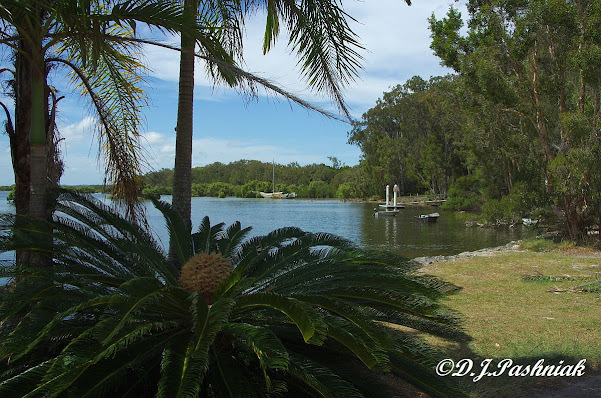 This view is taken from out on the bay and looking back to the picnic area and car park. There are picnic tables and barbeques under the shade of the trees. With a high tide I could kayak right into some areas that are usually too shallow to get into. 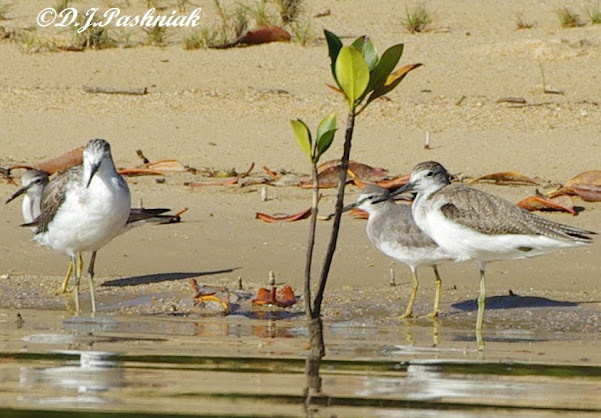 With the water high like this Grey-tailed Tattlers often roost on some of the Mangrove trees in this area. Looking in the other direction the clouds and lighting made the colors in the water quite different. These two were part of a large flock of Eastern Curlews that flew up from the other side of the roost and whirled overhead for a while before settling down again well away from my camera's reach. 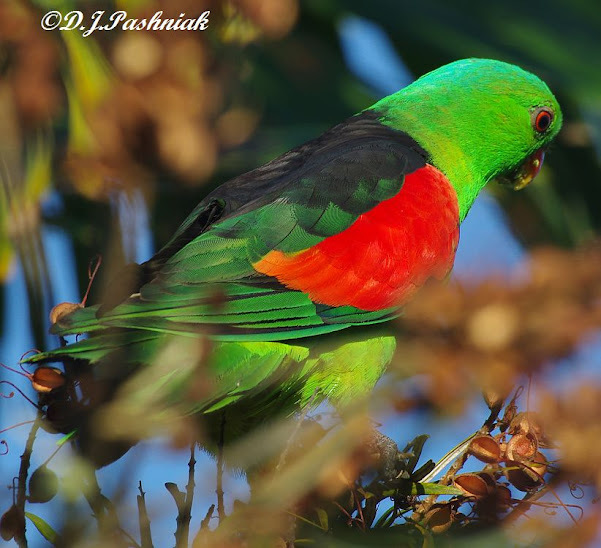 This post is for Bird Photography Weekly. 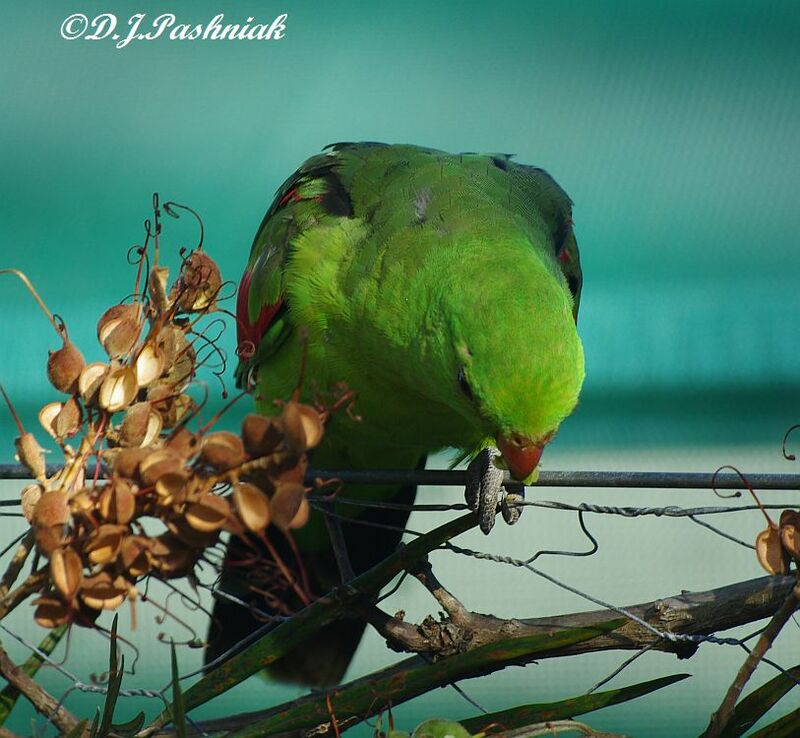 It's really nice when you have friends with special birds in their yard and you are invited around to see them. It's even nicer when these friends take photos of special bird events! 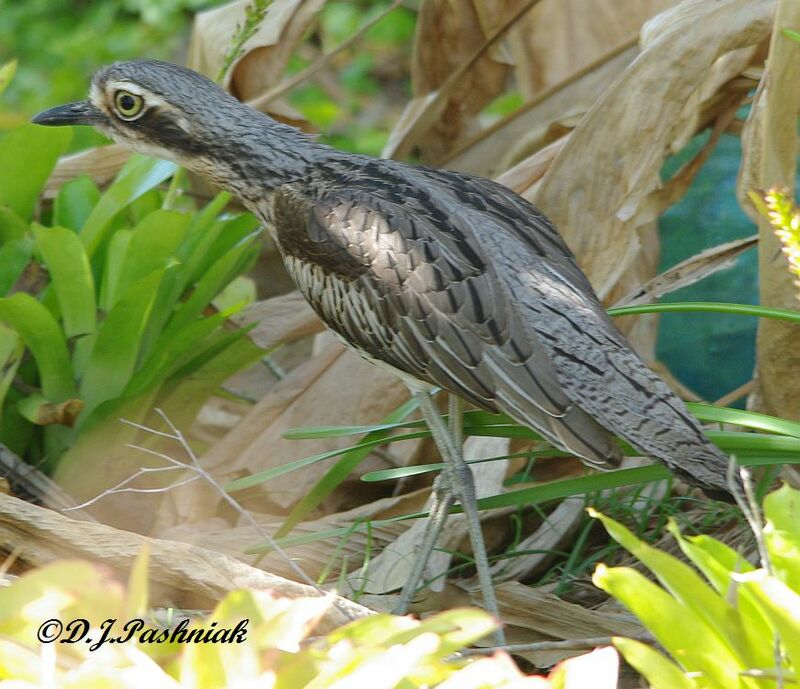 Back in July I went and visited the garden of Brian and Sue where there was a pair of Bush Stone-Curlews (Burhinus grallarius). 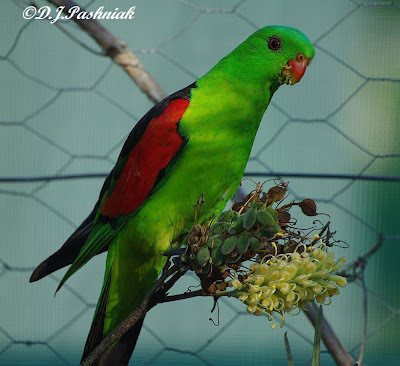 This is one of the photos I took then of one of the birds. 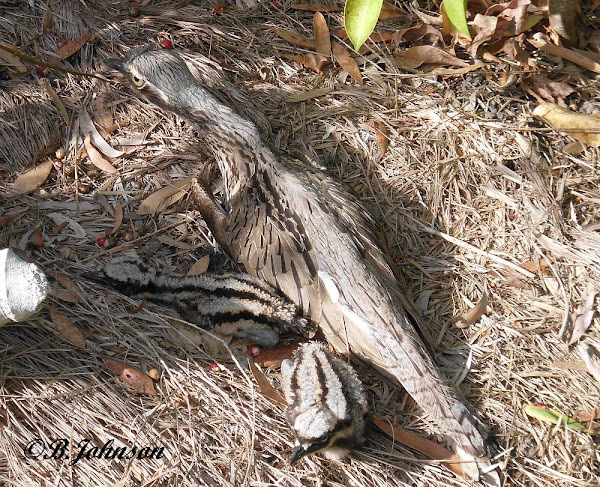 This time Brian and Sue brought photos around to my place so I could see the two very young birds that the parent birds were raising this year. 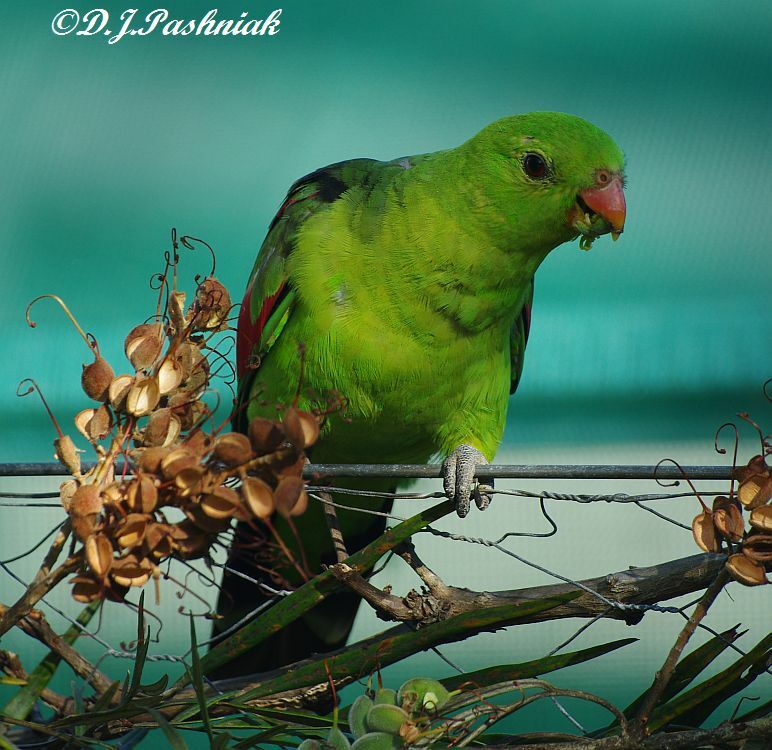 This pair of birds have lived in this garden for a number of years and have raised other young during this time. They are also very used to Brian and Sue working in the garden and coming close to where they are resting during the day. This photo shows a parent bird crouched down on the ground with the two little ones right next to it. The next moment the bird got up and left the young ones and came toward Brian telling him in unmistakeable terms that he was too close! He backed off! 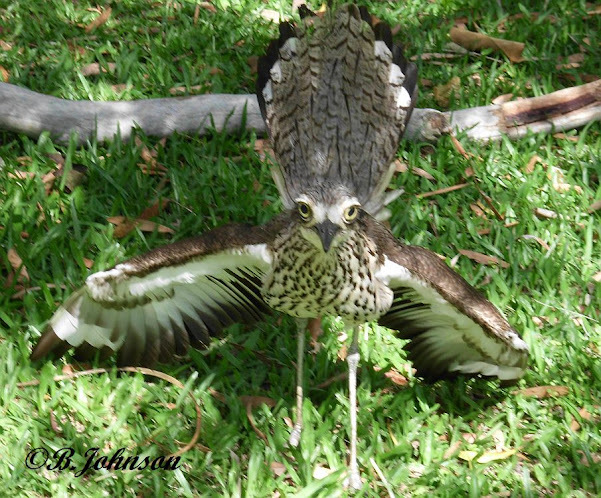 The parent bird went back to the young ones and peace again descended on the garden! 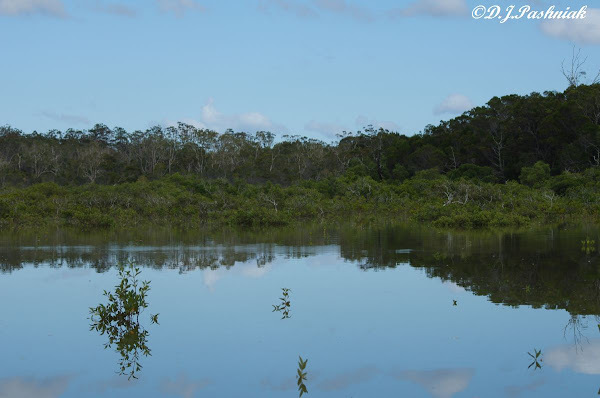 Mullens Creek has not got a big flow of fresh water in it (unless there is heavy rainfall!). 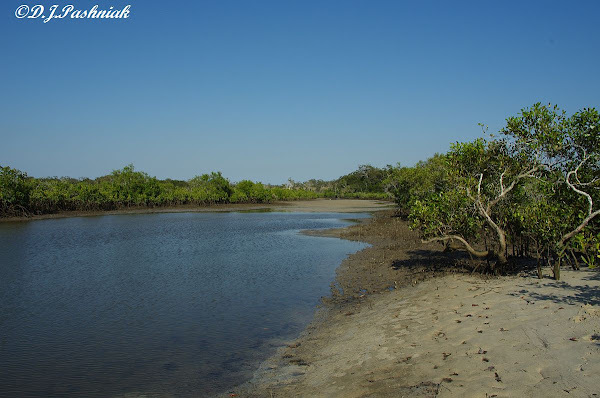 When the tide is out down at the bay the creek is nothing but a series of deep pools in between sandy stretches. 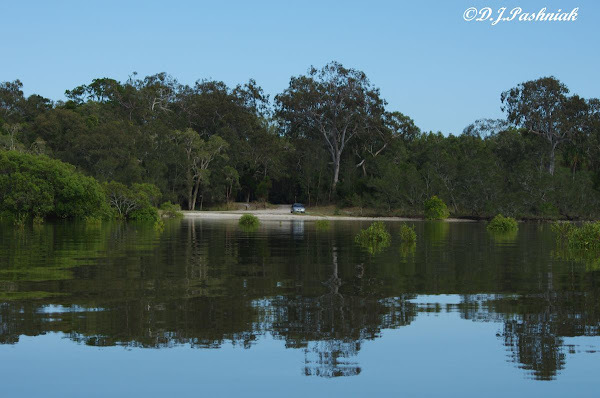 These photos were taken the other morning at low tide from the boat ramp. This is looking east out to the bay. The sun was still not high in the sky and shows a bright patch at the top of the photo as well as the silver sparkles on the water. 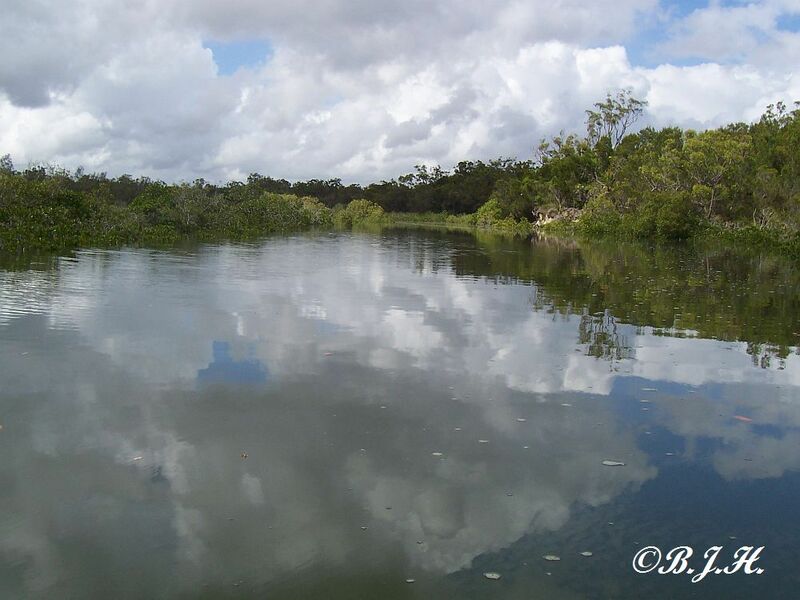 This is looking upstream along one of the channels. There was a White-faced Heron on the closest sand bank and an egret further upstream. 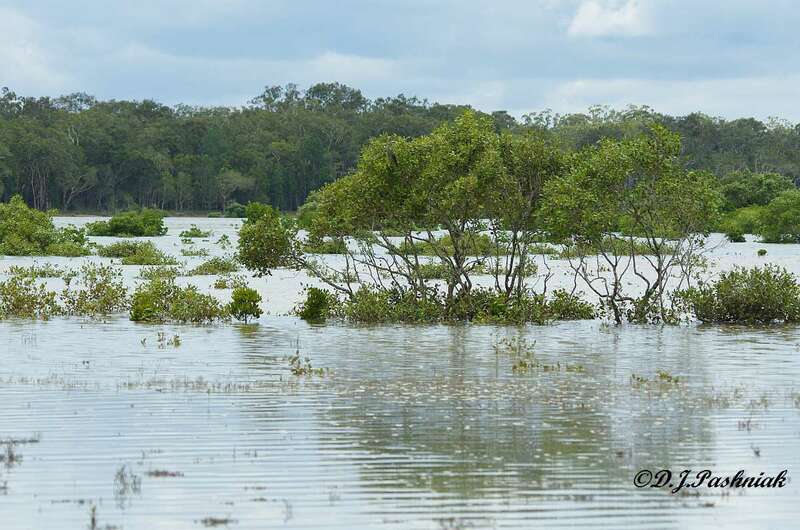 The same view but at high tide. This was taken a few years ago with a little 'point and shoot' camera. Sometimes it's not the quality of the photo that counts but the fact of a photo record at all! I was out at Inskip Point last week photographing shorebirds and rather as an after thought I turned around to photograph some of the Terns. There were four kinds there - Caspian, Crested, Common, and Little Terns - and I wanted some record shots. One of the birds I photographed was a Little Tern with a lot of breeding plumage and even a beak that was yellow with the black dot at the end. This didn't make sense to me at this time of year so I sent the photos on to an expert in Terns and the word came back that I had photographed one of the endangered Australian Little Terns on its way north to breeding grounds. 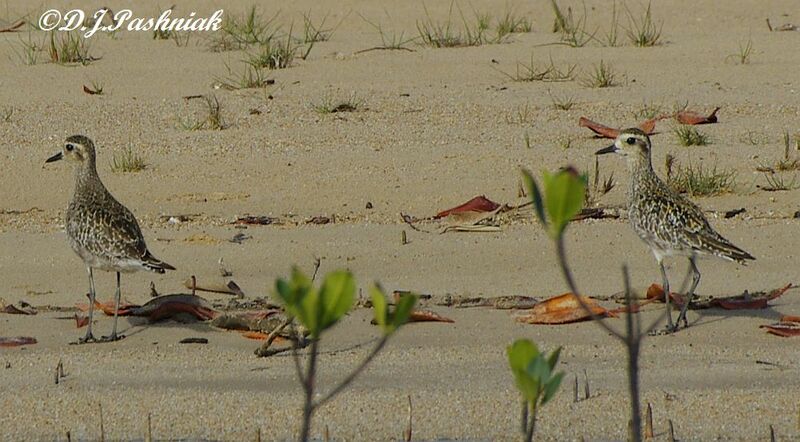 We see lots of Little Terns here but they are the population that breeds in Asia and flies south to spend summer here. 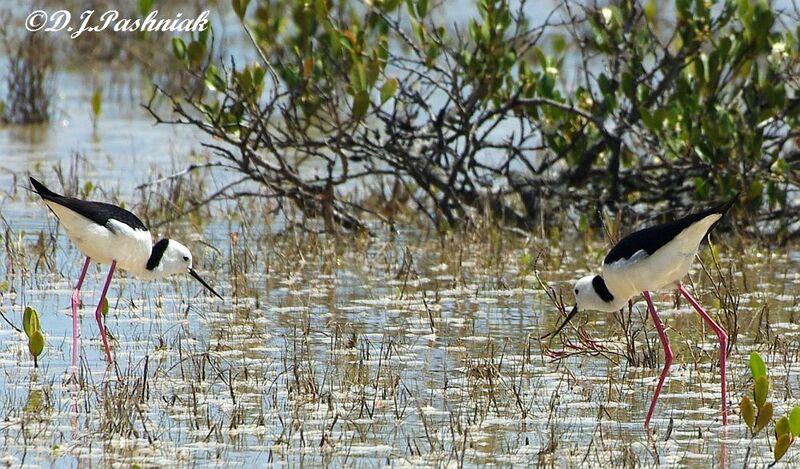 The population of Australian Little Terns only migrates within Australia. Unfortunately they are having a hard time breeding successfully as the beaches they use are also used widely by humans, and dogs, and (south of here) introduced foxes. 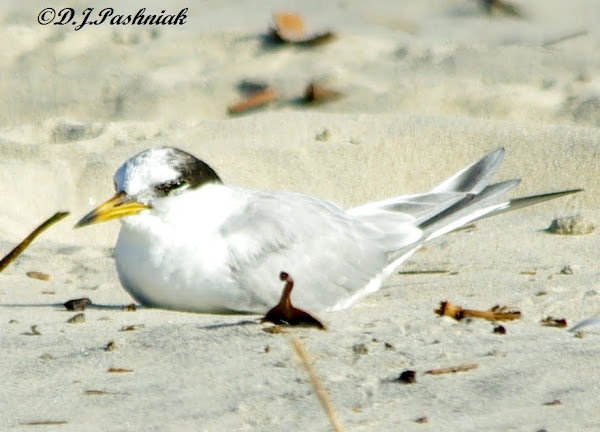 Inskip Point is recognized as an important shorebird roost but finding an endangered Little Tern there makes it even more important. 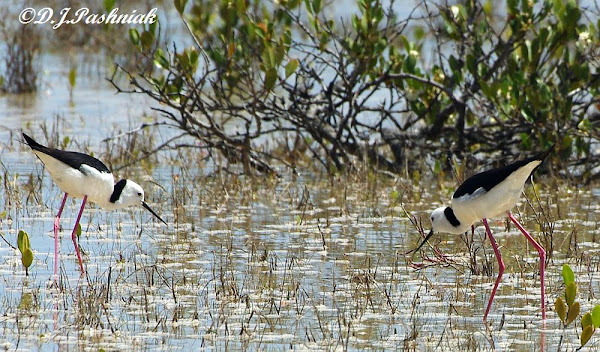 Added Later: After a number of comments I thought I should add that there are laws here in Australia (as well) protecting nesting shorebirds. 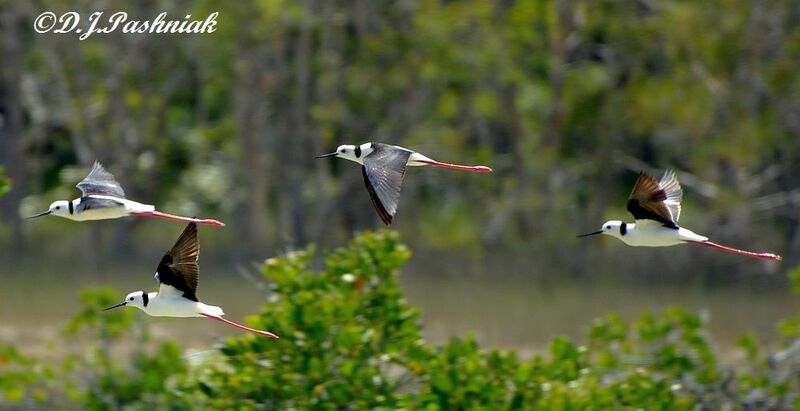 Also there are volunteers that do their best to protect Tern nesting sites. Unfortunately, it only takes one careless person with a dog off-leash! There is also a problem with enforcement of "no-go" areas. Unless there is a ranger with legal powers some few ignore signage! Sometimes I despair!! This post is for the watery meme at NatureFootstep Waters. 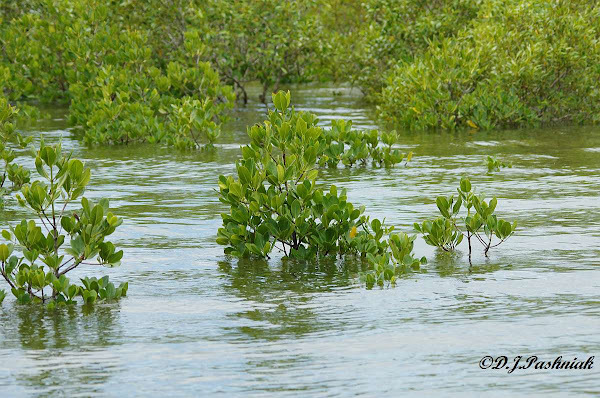 Mangroves line much of the bay where I usually watch shorebirds. Sometime, I must do a 'serious and scientific' post about the different varieties around here - but for this post I just want to show their beauty and diversity. 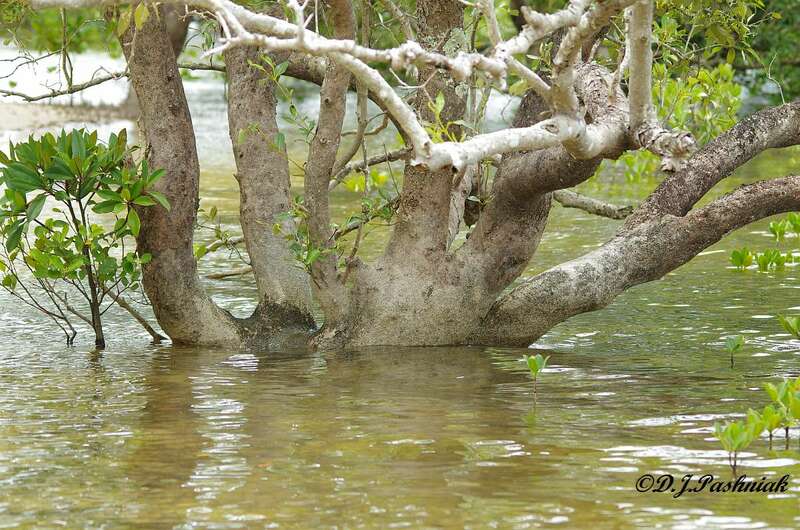 Mangroves need salt water around them. Some of them stand in water all day long and some of them only have the very highest tides wash around them. 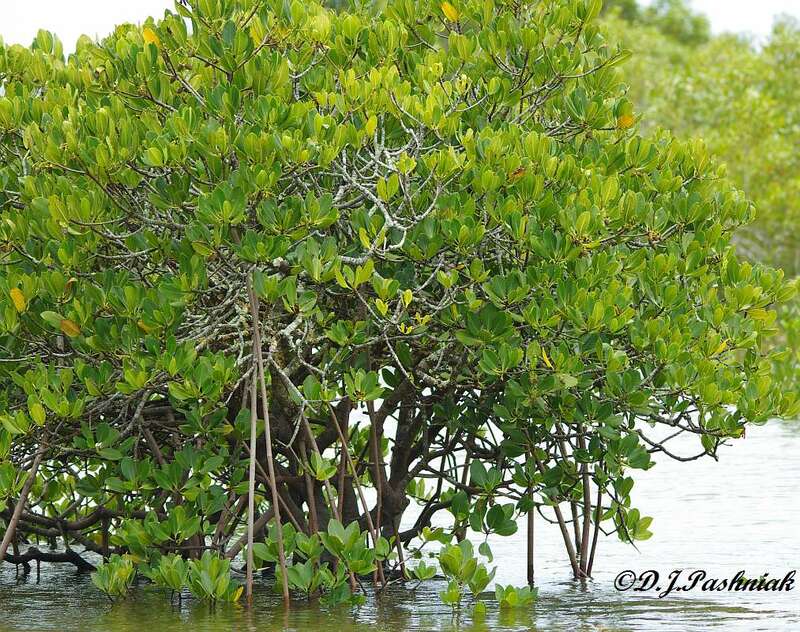 The biggest mangroves are quite large trees with big trunks and branches. 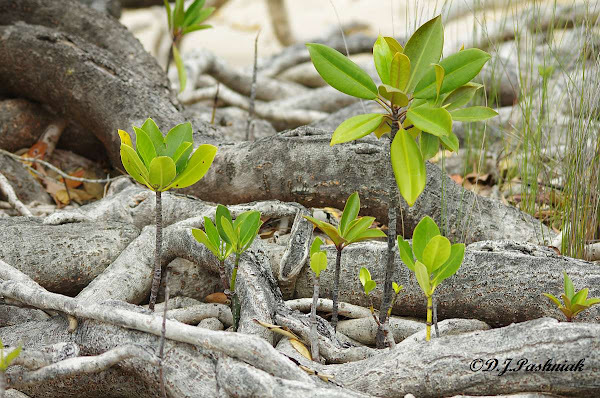 It's always a struggle to grow and these small mangroves have found shelter in the roots of another much larger tree. I don't know if they will survive here or if the shelter will eventually prove too inhibiting for their growth. Mangrove roots are diverse. This variety has aerial roots that hang down from the tree. This mangrove sends up numerous small roots through the sand into the air. 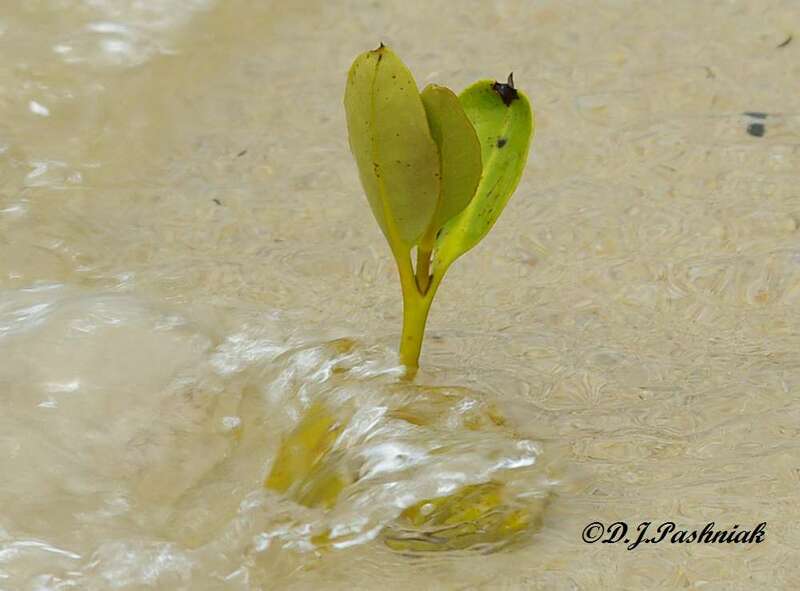 This is the seed of a Grey Mangrove that has just started to attach itself to the sand and send up leaves.